Mechanical Keyboards: Which One is Right for You? Tablets give us new possibilities when it comes to mobile computing. Unfortunately, they also give us new things to pack when it comes to carry-on luggage. The problem is simple: While a tablet is a great addition to any gadget-lover's arsenal, it isn't typically a replacement for an existing device. Most of us still need physical keyboards for long-form typing -- and with business travel in particular, that means you're lugging around both a tablet and a laptop. By adding a wireless keyboard to your tablet, though, you can transform it from a content-consuming slate into a far more versatile productivity machine. With the aid of a Bluetooth keyboard, I've been able to use my Motorola Xoom for all of my computing needs -- both work and personal -- while away from the office. The keyboard allows me to type desktop-style as needed; the rest of the time, I can use the tablet as a lightweight touch device. When it comes to keyboards, Android tablets do have a disadvantage: Because the tablets come in a variety of sizes and formats, keyboard manufacturers tend not to create the convenient combination keyboards/cases that are available for the iPad. However, there are still some really excellent options out there. Here are three full-sized, universally compatible keyboards worth considering. Logitech's Tablet Keyboard for Android 3.0+ packs in plenty of bang for your buck. In addition to a superb keyboard, the product comes with a protective case that doubles as a stand for your tablet, allowing you to position the device vertically while you type. This all-in-one functionality adds a lot of value to the Logitech unit. Of course, the most important thing is the keyboard itself -- and Logitech's creation is no slouch in that regard. The keys are nicely spaced out and very responsive; I found it comfortable to perform even the fastest of typing. The unit lies more or less flat when placed on a table, with an ever-so-slight upward slant. The Logitech Tablet Keyboard has five rows; the number keys at the top double as Android function keys when used in conjunction with a function (Fn) button. Those Android keys allow you to open your tablet's browser, music player, calendar, or Gmail app, as well as remotely control music playback and volume on the tablet. These are handy, but I would have liked it better if they had been dedicated rather than combination keys. The keyboard does have dedicated Search, Back, Home and Menu keys. Though all of the keyboards I tested offer Delete keys, the Logitech keyboard is the only one on which the key actually functions as you would expect: It deletes the letter that comes immediately after the cursor. For some reason, every other keyboard's Delete key either did nothing or served as a second Backspace key, deleting letters before the cursor instead of after it. In terms of accuracy, the Logitech keyboard's performance was outstanding, and I encountered few errors in prolonged use. When typing extremely fast, I did experience some sporadic issues in which certain letters would appear multiple times, or certain letters would be omitted even though I'd pressed them. This occurred rarely, however, and seems to be a common occurrence among Bluetooth keyboards. Motorola's Wireless Keyboard is a great option for any Android tablet owner. The keyboard stands out from the pack with its sleek design -- the lettering used on the keys has a futuristic, Android-like look -- as well as with its large, well-spaced keys. As a result of the size and spread of its keys, Motorola's unit is slightly larger than the other keyboards I tested -- just under half an inch longer and half an inch taller than the Logitech product. The difference certainly isn't enormous, but it might be relevant if you're concerned about portability. The Motorola Wireless Keyboard has six rows, the top of which features a series of useful Android-specific functions. These dedicated Android keys allow you to control music playback and volume as well as jump directly to a series of core apps such as Gmail, the browser, the music player and the contacts list. There are also dedicated keys for returning to the home screen, going back, activating the Android menu function and searching. Overall, the keys are responsive and easy to type on. Along the upper side of the keyboard's back surface, there is a raised ridge that causes the unit to sit at a noticeable slant when placed on a table. I found this made for a natural and more PC-like typing experience. The keyboard's performance was good most of the time. Like the Logitech model, Motorola's Wireless Keyboard did suffer from "sticky key" syndrome on occasion during my tests; the keyboard also fell behind once and dropped a few letters as a result. This was certainly more the exception than the rule, though; for the most part, the Motorola keyboard was accurate and precise. Targus's Bluetooth Wireless Keyboard for Tablets is the smallest and lightest of the full-sized keyboards I tested. Though it's considered a "tablet keyboard," the Targus unit is not made specifically for Android and consequently does not offer Android-specific function keys. The keyboard has six rows, though the top row is filled primarily with Windows-centric function keys (F1, F2 and so on) and serves no purpose when connected to an Android device. If you want to use a keyboard for multiple purposes -- say, to connect to a home PC and a tablet -- this configuration could ultimately make the keyboard more versatile and useful. For Android-specific scenarios, however, its generic nature is a bit of a drawback compared to the Android-tailored alternatives. The keyboard's layout has one other problem: The Backspace key is in the wrong spot. My brain is trained to press the key at the far right of the numbers row to perform the backspace function, since that's where practically every keyboard puts that command. On the Targus keyboard, for some reason, the Delete key resides in that location -- and when connected to an Android tablet, the Delete key doesn't actually do anything. I found myself having to regularly interrupt my thought process to look down and find the Backspace key, which is awkwardly placed at the right of the top row, alongside the function keys. Layout aside, the Targus keyboard sits on a slight slant, and its keys are large and easy to use. 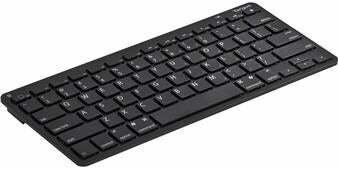 The keyboard is responsive, though somewhat noisier than the Logitech or Motorola models. Accuracy was excellent in my tests, with no "sticky key" experiences and only a smattering of missed letters during very fast typing. 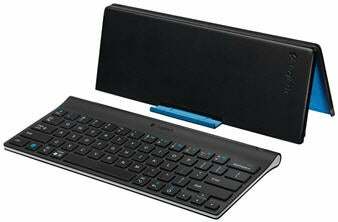 Targus's Bluetooth Wireless Keyboard for Tablets wins points for its light and compact design. It's also the least expensive model of the three here. But unless you're looking for a multipurpose keyboard, the Targus keyboard's lack of Android-specific functions puts it a notch below the other contenders. The Motorola Wireless Keyboard has the nicest form of any of the wireless tablet keyboards I tested. Its larger form and lack of bundled accessories put it just a hair behind Logitech's offering -- but with its excellent design and array of dedicated Android keys, Motorola's keyboard is a class act that's well worth its price. However, the Logitech Tablet Keyboard for Android 3.0+ is my pick for the best overall, universal Android tablet keyboard. Its outstanding performance, combined with the included carrying case and tablet stand, puts it a step ahead of the competition. JR Raphael is a syndicated writer and the author of Computerworld's Android Power blog. You can find him on Facebook, Twitter, or Google+. This story, "3 Bluetooth Keyboards for Android Tablets " was originally published by Computerworld.